The Radius is another one of those buildings that was going to be apartments, but once the real estate boom hit and the developer saw the bigger and quicker payoff, it was transformed into a luxury condo building. 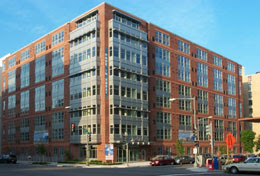 The Radius at Logan Circle (formerly Sovereign Circle) was originally designed for 170 “hard loft” style apartments, but converted to condos in early 2004. The units will offer 10 foot ceilings, exposed concrete and ductwork, dramatic walls of windows. While they converted the building from apartments to condo and to The Radius, they neglected to change the name of their web site's home page. The District has recorded 191 sales of the Radius' 170 units through mid-July. Unit #419 has not sold, it appears to be owned still by the developer. Unit #19, included in the total sold, does not have a sales price recorded in the District's real property sales database and the District's Recorder of Deeds; I've excluded it from the price analyses in this post. The table below details the average price, average price per square foot, average unit size, and the number of sale for each unit size [studio, 1, and 2 bedroom units] at the Radius. Twenty-two units have been resold since 2004. This building's appraisal data is available so I've been able to calculate price per square foot for each sale. I've calculated the seller's return on each sale differently this time. In the past, I simply divided resale price by original purchase price, minus 1, to determine the per cent price increase [or return]. That is, if a unit originally purchased for $50,000 was resold for $100,000, I'd report a 100% price increase [ $100,000 / $50,000 - 1]. However, that ignores the passage of time between purchases. - a 100% return in a year is much more impressive than one that occurred after 20 years. CAGR: the year-over-year growth rate of an investment over a specified period of time. The compound annual growth rate is calculated by taking the nth root of the total percentage growth rate, where n is the number of years in the period being considered. I thought CAGR would indicate whether a condo was a worthwhile long term investment vice putting money in a one-year T-bill yielding 4.03%. I think of it as a quasi-IRR hurdle rate. 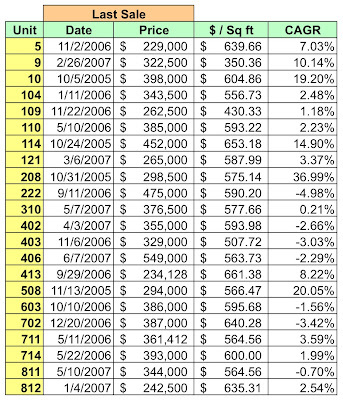 It turns out a one year T-bill is a better deal: only 7 of 22 resales had a CAGR greater than 4.03% and of those, the units with the highest returns were those purchased in 2004 near the peak of the recent housing boom [units #10, #114, #208, and #508] and resold in 2005. Oddly, none of the top seven are two-bedroom units; only 2 such units have resold [units #222 and #406] and both yielded negative returns. $1800: 1/1, 700 sq ft.
$3000: 2/2, 1050 sq ft.
One unit is currently listed for sale [MLS DC6517905]. Unit #15, a 2/2 with 1054 sq ft and a $527/month condo fee, is available for $579,900, down from $629,900. It had been purchased for $554,900 in October 2004. If it sells at its current price, assuming a 6% commission and excluding any other transactions costs, the seller will lose at least $9800. The seller offers the buyer the choice of one of two enticements: a year's condo fees paid or keep the current "tenents" who're paying $2900/month for one year. Given that the realtor's web site estimates the condo's mortgage at the offered price will be [at least] $3460, I'd send the "tenents" packing. The Radius is the ugliest, most useless "loft" out there: tiny, ugly, but most importantly, overpriced units. Many barely qualify as studios. There is no upside in buying into this building, it truly is just a place to set your head down, not a place you would aspire to live. I dont think so...I lived at the Radius and I loved it! The space is awesome if you know what to do with it. The buliding is awesome! I would see it for yourself before makeing an decisions. The patio is really nice as well. Have many friends who live in the building, and wouldn't dare step foot in it as an investment or a place to live. - Condo fee rose 30% in last year. - Roof and other flood issues. - Highest ppsf in the neighborhood. - If purchased in '03-05, can sell at a loss of 20%. - Neighbors are locked in, aging population, and lots of drama. I've lived at the Radius since it opened. The units are sunny, stylish, and the common areas are well-maintained - great private courtyard, community lounge, and lobby with nice lofty, airy, sunny presence. The condo fee was raised 25% to fix the roof and it is my understanding the Board is planning to revert the condo fee. The roof has been completely replaced as a result of a window washing firm tying off onto their vent pipes - all fixed. The population is actually a nice mix from babies to grandparents with lots of working stiffs in between. As for the drama, the chief dramatist resigned from the board and there have been much-needed management changes. All in all, a great place to live. I recently moved into the Radius and am renting from an owner. The best things about my unit are the kitchen and the bathroom. Top-of-the-line appliances and ample storage in the kitchen. Bathroom is nice and big. I also get good light with a northern exposure. Windows are nice and big, though they are not that well-sealed and you can feel the cold air coming in. - There are two utility closets in the back corners of the loft. You cannot store anything in these, which is understandable to avoid fires etc. But the doors also swing out so that you can't put anything outside them either. This reduces the usable square footage. - The two doors that enter the bathroom crash into each other. - Part of the walk-in closet is awkward to get into: you have to enter the closet, close the door, and go in behind the door. Should have a sliding door. - General stuff: There is a lot of paperwork and a lot of rules around move-in. Plus a considerable move-in fee. While I recognize condos need rules, it just seemed the process was twice as complicated and time-consuming (not to mention expensive) as it needed to be. Still, it is a good place for me in the short-term.